Aníbal Alejandro Sánchez...Attended U.E. San Pedro Alesandrino (VEN) High School...He and his wife, Ana, have two children: Anabella and Aníbal Alejandro. Went 7-6 with a 2.83 ERA in 25 games (24 starts) for the Atlanta Braves...His 2.83 ERA was the second-best mark of his career and the best since he posted a 2.57 ERA in 2013 as a member of the Detroit Tigers...He struck out 135 batters in 136.2 innings and posted a career-best 1.08 WHIP... He surrendered just 15 home runs, his fewest since 2014 with Detroit...Among National League pitchers with at least 24 starts, he ranked sixth in ERA (2.83), seventh in opponent batting average (.213), ninth in opponent on-base percentage (.278), ninth in WHIP (1.08) and tenth in opponent slugging percentage (.354)...He allowed the fifth-fewest home runs (15) and issued the ninth-fewest walks (42) among National League pitchers (min. 24 GS)...Held left-handed batters to a .191/.279/.294 slash line...His .294 opponent slugging percentage against left-handed batters was the best among National League right-handed starting pitchers, while his .191 opponent average was good for third. Appeared in 35 games, including 26 starts, with the Tigers in 2016... Posted a 5-12 record with a 6.04 ERA (138.2IP/93ER) and 124 strikeouts in 26 starts, while he went 2-1 with a 4.30 ERA (14.2IP/7ER) and 11 strikeouts in nine relief appearances... Picked up the win in his season debut on April 6 at Miami, tossing 5.0 innings with two runs on four hits and three strikeouts... Made his first relief appearance of the season on June 6 vs. Toronto, throwing a scoreless inning with one strikeout... Recorded his first double-digit strikeout performance of the season on July 19 vs. Minnesota, striking out 10…also had 10 strikeouts on August 7 vs. New York (NL)...Pitched a season-high 8.0 innings on August 7 vs. New York (NL), allowing a run on four hits...Tossed 7.0 scoreless innings on August 17 vs. Kansas City, allowing one hit with two walks and eight strikeouts…retired the first 12 batters he faced and carried a no hitter until two outs in the seventh inning when Eric Hosmer hit a double -- according to the Elias Sports Bureau, it marked the seventh time in Sanchez's career that he has taken a no hitter into the seventh inning, which is second-most among active pitchers, trailing only Justin Verlander...Lefthanded hitters posted a .261 (80x306) batting average, while righthanders batted .310 (91x294) against him... Appeared in 17 games, including 12 starts, at home and went 4-6 with a 5.01 ERA (73.2IP/41ER) and 71 strikeouts, while he was 3-7 with a 6.67 ERA (79.2IP/59ER) and 64 strikeouts in 18 road outings, including 14 starts... Posted a 5-10 record with a 6.75 ERA (82.2IP/62ER) and 71 strikeouts in 22 games, including 14 starts, prior to the All-Star break, while he went 2-3 with a 4.84 ERA (70.2IP/38ER) and 64 strikeouts in 13 games, including 12 starts, following the All-Star break. Completed his third full season with the Tigers in 2015 -- compiled a 10-10 record with a 4.99 ERA (157.0IP/87ER) and 138 strikeouts in 25 starts. Appeared in his 200th career game on April 23 vs. the New York Yankees. Made his 200th career start on May 3 at Kansas City -- became the seventh Venezuelan-born player in major league history to start 200 games on the mound. Struck out a season-high 11 batters on May 24 vs. Houston -- marked his 11th career double-digit strikeout performance. Tossed the eighth shutout of his career on June 15 vs. Cincinnati, allowing only two hits and striking out seven...the shutout was the first for Sanchez since May 24, 2013 vs. Minnesota. Had a streak of 21.2 consecutive scoreless innings from June 3-21 -- the streak was the second longest of his career, trailing only a 23.0 consecutive innings scoreless streak from July 6-25, 2006. Finished the month of June with a 3-1 record, a 2.63 ERA (37.2IP/11ER) and 27 strikeouts in five starts. Posted a seven-decision winning streak from June 9-July 22, which was tied for the longest streak of his career -- during the eight-start stretch, he had a 7-0 record with a 3.16 ERA (57.0IP/20ER) and 46 strikeouts. Placed on the 15-day disabled list with a right rotator cuff strain on August 20 -- examined on September 16 by Dr. James Andrews in Pensacola, FL...he underwent a MRI arthrogram, which showed no major structural damage, received a PRP injection and was shut down for the remainder of the season. Compiled a 7-4 record with a 4.86 ERA (96.1IP/52ER) and 82 strikeouts in 15 starts at Comerica Park...while he went 3-6 with a 5.19 ERA (60.2IP/35ER) and 56 strikeouts in 10 road starts. Posted an 8-7 record with a 4.63 ERA (118.2IP/61ER) and 106 strikeouts prior to the All-Star break...while he went 2-3 with a 6.10 ERA (38.1IP/26ER) and 32 strikeouts after the All-Star break. Lefthanded hitters posted a .217 (69-for-318) batting average...while righthanders batted .291 (83-for-285) against him. Limited to 22 games with the Tigers due to two separate stints on the disabled list in 2014...Allowed just four home runs all season -- the fewest among all major league pitchers (min. 100 IP)...Sidelined April 27-May 18 with a right middle finger laceration...Compiled a season-high five-game winning streak May 18-June 25 -- posted a 2.42 ERA(52.0IP/14er) and 40 strikeouts during the eight-start stretch...Named the Tigers Pitcher of the Month for June after compiling a 3-0 record, a 2.79 ERA (38.2IP/12er) and 25 strikeouts in six starts during the month...Fanned Alberto Callaspo in the fourth inning on June 30 versus oakland to record his 1,000th career strikeout -- became the seventh Venezuelan-born pitcher to strike out 1,000 batters in the majors...Posted a season-best 12 strikeouts on August 3 versus Colorado...Sidelined August 9-23 with a right pectoralis major strain...Appeared in one game out of the bullpen for the Tigers in September -- did not allow a run in 1.0 inning pitched...Limited lefthanded batters to a .219 (62x283) batting average...righthanded batters hit .241 (46x191) with him on the mound...Posted a 6-3 record, a 3.04 ERA (94.2IP/32er) and 70 strikeouts in 16 starts prior to the All-star break...compiled a 2-2 record, a 4.60 ERA (31.1IP/16er) and 32 strikeouts in six games (five starts) following the break...Compiled a 4-5 record, a 3.53 ERA (82.2IP/32er) and 67 strikeouts in 14 games (13 starts) at Comerica Park... posted a 4-0 record, a 3.25 erA (44.1IP/16er) and 35 strikeouts in eight starts on the road...Made his first career postseason appearance out of the bullpen for the Tigers during the ALDS -- did not allow a run and fanned two over 2.0 scoreless innings of relief in game 2 at Baltimore. Completed his first full season with the Tigers in 2013, establishing a career high with 14 wins, and matching a career high with 202 strikeouts...Led the American League with a 2.57 ERA (182.0IP/52ER), while he was third with 9.99 strikeouts per nine innings, sixth with 202 strikeouts and a .229 bating average against, and tied for eighth with 14 wins...Registered a quality start in seven of his first eight decisions to begin the season, posting a 4-3 record, a 2.05 ERA (52.2IP/12ER) and 66 strikeouts during that stretch...Established a career-high and franchise record with 17 strikeouts on April 26 versus Atlanta -- the 17 strikeouts also established a new record for most strikeouts by any one pitcher in an Interleague game, and matched the most strikeouts ever recorded by a pitcher in 8.0 innings-or-less...Named the Tigers Pitcher of the Month for April after posting a 3-1 record, a 1.34 ERA (33.2IP/5ER) and 41 strikeouts in five starts during the month -- ranked third in the American League in ERA, while he was tied for fifth in strikeouts during that stretch...Tossed a complete game shutout on May 24 versus Minnesota -- allowed just one hit in 9.0 innings to record his fourth career one-hit game -- he joined Bob Feller as the only two pitchers since at least 1916 to record five complete games allowing one hit-or-fewer in the first 155 games of their major league career...Did not make his scheduled start on June 9 versus Cleveland due to a stiff shoulder...Sidelined June 16-July 5 with a right shoulder strain...Posted a 3-2 record, a 2.15 ERA (29.1IP/7ER) and 19 strikeouts in five starts during July...Recorded a quality start in 11 of 12 appearances from July 19-September 17...posted a 7-1 record, a 2.03 ERA (80.0IP/18ER) and 77 strikeouts during that stretch...Compiled a 2-1 record, a 2.05 ERA (30.2IP/7ER) and 39 strikeouts in five games during September...Limited lefthanded batters to a .246 (91x370) average...righties hit .208 (65x312) with him on the mound...Posted an 8-3 record, a 2.70 ERA (93.1IP/28ER) and 110 strikeouts in 14 starts at home...compiled a 6-5 record, a 2.44 ERA (88.2IP/24ER) and 92 strikeouts in 15 games on the road...Compiled a 7-6 record and a 2.93 ERA (92.0IP/30ER) and 111 strikeouts in 15 games prior to the All-Star break...posted a 7-2 record and a 2.20 ERA (90.0IP/22ER) in 14 games after the break...Appeared in three games for the Tigers in the postseason...struck out 12 batters and did not allow a hit in Game 1 of the ALCS against the Boston Red Sox -- according to Elias, it is the most strikeouts by a pitcher before allowing a hit in a postseason game in major league history. Opened the 2012 season with the Miami Marlins before being acquired by the Tigers in a five-player deal (both clubsswapped a compensation draft choice as well) on July 23. ... Registered a quality start in each of his first eight starts of the season April 9-May 19 -- posted a 2-2 record, 2.32 ERA(54.1IP/14ER) and 55 strikeouts during the eight-start stretch. ... Established a career high with 14 strikeouts on April 28 versus Arizona -- marked the third time in his career he hasreached a double-digit strikeout total in a start. ... Finished 1-0 with a 2.73 ERA (26.1IP/8ER) and 33 strikeouts in four starts during April -- fourth in the National Leaguewith 33 strikeouts during the month. ... Posted a 2-3 record, 2.45 ERA (40.1IP/11ER) and 34 strikeouts in six starts during May. ... Registered a quality start in five consecutive starts August 22-September 15 -- finished 2-2 with a 1.89 ERA(33.1IP/7ER) during that stretch. ... Tossed a three-hit shutout on September 25 versus Kansas City -- marked the fifth shutout of his major leaguecareer...fanned 10 batters in the outing, the fourth time during his career he has reached a double-digit strikeout totalin a start. ... Finished 2-2 with a 2.43 ERA (40.2IP/11ER) and 37 strikeouts in six starts during September -- tied for fifth in theAmerican League with 37 strikeouts during the month. ... Posted a 4-6 record and 4.12 ERA (107.0IP/49ER) in 17 starts prior to the all-star break...compiled a 5-7 record and3.55 ERA (88.2IP/35ER) in 14 starts following the all-star break. ... Limited lefthanded hitters to a .243 batting average (98x404)...righties batted .291 (102x351) against him. Ranked sixth in National League (13th in Majors) in strikeouts. Set a new career highwith 11 strikeouts on May 8 vs. Washington, a mark he would tie on September 10 atPittsburgh...Set a new career high with a six-game winning streak from April 22 to June 26. However,also suffered longest drought of career in terms of both starts without a winand consecutive losses. After earning sixth win on June 10 vs. Arizona, went 11 startsbefore next victory (on August 16). In that span, went 0-5 with a 5.31 ERA (61.0 IP/36ER), and opponents batted .306 (76x248) with seven home runs, 16 doubles andthree triples...From May 8-31, went 4-0 with a 1.15 ERA (39.0/5) over five starts. Prior to that, lastMarlins' pitcher to go 4-0 or better with an ERA that low over a five-start span wasA.J. Burnett, who went 5-0 with a 0.93 ERA over a five-start span from July 30 to August19 of 2005 (Elias Sports Bureau)...On April 22 vs. Colorado, lost no-hit bid in ninth inning but completed a one-hit, 4-1victory over Rockies...Also had two complete-game shutouts. Second of two was also a one-hitter, onSeptember 10 at Pittsburgh, which marked final win of season. Prior to that, on May26 at San Francisco, gave up five hits and two walks while striking out eight, holdingGiants scoreless in a 1-0 win...Now has a no-hitter and three one-hitters since making Major League debut in 2006;no other ML pitcher over that span has thrown four complete games allowing eitherone hit or no hits. Only Mark Buehrle, Matt Cain, Matt Garza, Roy Halladay, Tim Hudson,Roy Oswalt and Justin Verlander have had more than one, all with two (EliasSports Bureau)...Has four career 9.0-inning complete games with one-or-fewer hits. Of 12 times thathas happened in Franchise history, Kevin Brown is only other pitcher who has accomplishedthe feat multiple times (twice). Those outings include a no-hitter for bothSanchez (September 6, 2006 vs. Arizona) and Brown (June 10, 1997 at San Francisco)...Through first 16 starts, was 6-1 with a 2.82 ERA (105.1/33), with a .231 opponents' battingaverage (90x389). In final 16 starts, was 2-8 with a 4.65 ERA (91.0/47) and a .270opponents' batting average (97x359). In his first full season without injury, went 13-12 with a 3.55 ERA in 32 starts for the Marlins.Established single-season career highs in games (32), starts (32), innings pitched (195.0) and strikeouts(157). Led Club in starts and innings pitched and ranked second in strikeouts ... llowed just 10 home runs, tied with Ubaldo Jimenez for the fourth-fewest in the National Leagueamong starters with at least 25 starts. He followed Josh Johnson (7), Chad Billingsley (8) andJaime Garcia (9) ... Earned wins in four straight starts from May 14-30 to equal a career-best. Now has four four-gamewin streaks in his career ... His best month came in May when he went 4-0 with a 1.93 ERA (37.1 IP/8 ER) in six starts. Posteda first-half record of 7-6 with a 3.66 ERA (103.1 IP/42 ER) with 39 walks and 71 strikeouts in 17 starts.In 15 second-half starts, went 6-6 with a 3.44 ERA (91.2 IP/35 ER), issuing 31 walks while striking out86 ... Made 19 starts on four days rest, going 7-8 with a 2.71 ERA (119.2 IP/36 ER). With five daysbetween starts, went 5-3 with a 4.96 ERA (45.1 IP/25 ER) in eight games. When having six-or-moredays between starts, had a 1-1 record and 4.80 ERA (30.0 IP/16 ER) in five games ... Tossed his second career shutout and third career complete game on July 29 at San Francisco.Held the Giants to just one hit with one walk and eight strikeouts. His previous shutout was onSeptember 6, 2006 when he no-hit the Arizona Diamondbacks at Sun Life Stadium. He and KevinBrown are the only pitchers in Marlins history with two complete-game wins in which they allowedno more than one hit. Brown threw a no-hitter for Florida in San Francisco in June 1997 and he followedthat with a one-hitter against the Dodgers a little over a month later. - Elias ... In eight starts from April 22 to May 30, did not allow more than two runs in any start. Posted a 5-1 record and 1.97 ERA (50.1 IP/11 ER) in that span ... Struck out eight Cardinals on May 19 at Busch Stadium to equal a career-high. Again equaledthe mark on July 29 at San Francisco. In his career, also recorded eight K's on September 20, 2008vs. Philadelphia, August 11, 2008 vs. St. Louis and September 11, 2006 vs. New York ... Ranked eighth in the NL in home ERA at 2.65 (91.2 IP/27 ER). Made nine starts during the day andposted the fifth-lowest day ERA in the NL at 2.34 (57.2 IP/15 ER) ... Made it to the sixth inning or later in 24 of his 32 starts, with seven of those starts lasting at least 7.0innings. Totaled 20 quality starts on the season, which was second on the Club behind JoshJohnson (23) ... veraged 101.2 pitches per start and tossed a career-high 126 on August 31 vs. Washington ... Right-handed batters hit him at a .252 clip (96x381) with six home runs, while lefties hit .262(96x367) with four home runs. Mired by two separate right shoulder sprains, made only 16 starts for the Marlins and posted a 4-8 record and 3.87 ERA...Marked first stint on the 15-day Disabled List from May 8 to June 1. Prior to going on the DL, went1-4 with a 5.79 ERA (32.2 IP/21 ER) in six starts. Made a start on June 2 against Milwaukee, allowingonly one run on two hits over 3.0 innings. Placed on the 15-day DL on June 4 (retro to June3) and reinstated on August 21. He went 2-0 with a 1.92 ERA (23.1 IP/5 ER) in five rehab starts...Finished the season with a 3-4 record and 2.86 ERA (50.1 IP/15 ER) in nine starts after returning fromthe DL. Among all National League starters, ranked third in ERA from August 21 to the end of theseason (Homer Bailey-1.70 and Ryan Dempster-2.27)...Won first decision of the season, April 16 at Atlanta. Also earned wins on August 21 at Atlanta,September 22 vs. Philadelphia and October 3 at Philadelphia...Took losses in four straight starts from April 21 to May 7, establishing a career-long losing streak...Tossed a season-best 8.0 innings, while equaling a season-high with seven strikeouts, in the secondgame of a September 22 doubleheader against the Phillies. Also struck out seven batters onSeptember 17 at Cincinnati and August 21 at Atlanta...In his 16 starts, surrendered more than three earned runs only three times and held opponents totwo-or-less earned runs nine times...Gave up a season-high six runs twice, doing so in consecutive starts; April 27 at New York andMay 2 at Chicago...Issued a career-high eight walks in a September 28 loss to the Braves at Turner Field, though heallowed only three runs on two hits over 5.0 innings. Started 2008 campaign on 15-day Disabled List after havingright shoulder surgery, June 21, 2007...surgery was performed byDr. James Andrews...transferred to 60-Day DL, May 23...madefive rehab starts before being returned from rehab and reinstatedfrom the Disabled List, July 31...started first game of the seasonthat day, earning the win over COL (5.2 IP, 6 H, 2 R, 2 ER, 4SO)...in first four starts, went 2-2 with a 3.52 ERA (23 IP/9 ER)...overhis final three starts posted a 0-3 record and 7.22 ERA (28.2 IP/23ER)...set a career-high with five losses...Averaged 5.1 innings per start, down from a 6.0 inning-per-startaverage coming into this season...Marlins were 4-6 in gamesthat he started...had highest run support of any Marlins starter at4.88 and averaged 8.7 strikeouts per nine innings...over hiscareer, has allowed more than four runs in a game only fourtimes in 33 starts...Marlins are 17-13 overall when he takes themound...Held right handed hitters to .188 average (18x96) while leftiesbatted at a .340 clip (36x106)...allowed seven home runs over51.2 innings...prior to 2008, had surrendered only 12 homers in144.1 innings...Tossed a season-high 7.0 innings on two seperate occasions;August 11 vs. STL and September 14 vs. WSH...on September 8at PHI, lasted 1.2 innings, marking the shortest start of his career(5 H, 5 R, 5 ER, 2 BB, 2 SO)...tied his career-high with eight strikeoutsin a game two times; August 11 vs. STL and September 20vs. PHI...suffered longest losing skid of his career, dropping threegames from August 28-September 20. Started six games for Florida in 2007, going 2-1 with a 4.80 ERA (30.0 IP)...optioned to Albuquerque(AAA) May 4 and was placed on Disabled List May 7...had right shoulder surgery performed byDr. James Andrews on June 21, and missed the remainder of the season. Went 10-3 with 2.83 ERA in 18 games (17 starts) during his first Major League season...finished among the National League rookieleaders with one shutout (T-2nd), two complete games (T-1st) and 10 wins (9th)...his two complete games tied the franchise rookierecord set by Dontrelle Willis in 2003...Threw no-hitter on September 6 vs. Arizona in just his 13th Major League start...he faced just 31 batters, including four walks and sixstrikeouts...it marked the 233rd (127th in NL) no-hitter in Major League history, the first since Randy Johnson threw a perfect gameagainst the Braves as a member of the Diamondbacks on May 18, 2004...the no-hitter was the fourth in Marlins history, the first sinceA.J. Burnett held the Padres hitless in San Diego on May 12, 2001...he became the 19th Major League rookie to throw a no-hitter,the first since Bud Smith no-hit the Padres with the Cardinals on September 3, 2001...he became just the second Venezuelan-bornpitcher to toss a no-hitter, joining Wilson Alvarez, who no-hit the Orioles as a rookie member of the White Sox on August 11, 1991...for his efforts, Sanchez was named the National League Player of the Week for the week of September 4-10...Went 10-3 with 2.37 ERA in 17 starts... made his Major League debut on June 25 at New York (AL), earning his first ML win and holdingthe Yankees scoreless on seven hits with two strikeouts in 5.2 innings...became only the second starting pitcher in the last 10years to make his Major League debut as a visitor at Yankee Stadium and win, joining Gustavo Chacin (9/20/04 with Toronto)...wonthree consecutive starts from July 14-25, winning vs. Houston (July 14), vs. Washington (July 19) and at Atlanta (July 25)...did notallow a run in back-to-back seven-inning outings on July 14 vs. Houston and July 25 vs. Washington...allowed one earned run onseven hits with three strikeouts in 7.0 innings en route to victory on July 25 at Atlanta...suffered first Major League loss on July 30 at Philadelphia, allowing a career-high eight earned runs in 4.1 innings...won four straight decisions in five starts from August 21 toSeptember 11...recorded career-high eight strikeouts in win on September 11 vs. New York (NL)...tossed second complete gameon September 16 at Atlanta, allowing two earned runs in 8.0 innings and taking the loss...With his 10th win on September 27 vs. Cincinnati, became the fourth Marlins rookie pitcher for season with 10 wins, joining ScottOlsen (12-10), Josh Johnson (12-7) and Ricky Nolasco (11-11)...the Marlins became the first team in Major League history to havefour rookie pitchers with 10+ wins...was one of five Marlins pitchers to reach the 10-win plateau, the first time in club history that hashappened in a season...Set a Marlins rookie record by tossing 23.0 scoreless innings from July 6-25...the streak started in the second inning at Washingtonon July 6, and stretched until the sixth inning in Atlanta on July 25...the previous rookie record was 19.0, set by Dontrelle Willis in 2003...Made one relief appearance, July 1 against Boston... threw 4.1 innings of long relief, after Brian Moehler left the game due to injury...Sanchez stuck out five batters, but allowed three home runs -- one to Manny Ramirez and two to David Ortiz...Went 4x35 at the plate with two RBI... recorded first Major League hit with an RBI-single to center field off Washington's LivanHernandez on July 6 at RFK Stadium...went 2x4 on September 11 vs. New York (NL)...Went 3-6 with a 3.15 ERA in 15 starts with Carolina (AA)...had two complete games and 92 strikeouts over 85.2 innings...tossed a 9.0-inning shutout in his last start on June 19 at Charlotte. Split season between Wilmington (A) and Portland (AA) in the Boston Red Sox organization... went 6-1 with a 2.40 ERAin 14 starts for Wilmington to earn a July 4 promotion to Portland, where he went 3-5 with a 3.45 ERA in 11 starts to closeout the season... struck out 158 batters in 136.0 innings between the two clubs, an average of 10.5 strikeouts per nineinnings... Began season with Wilmington and allowed just one earned run in six starts (36.2 IP) at Frawley Stadium, going 4-0 with a 0.25 ERA... fanned a season-high 14 batters in 6.0 innings in his second start of the season April 16 vs. Salem... wasselected to the mid-season Carolina League All-Star Team and the World Team in the XM Satellite Radio All-Star FuturesGame... Went 5-0 with a 2.09 ERA over his final 11 starts with Wilmington and 3-1 with a 0.98 ERA (3 ER/27.2 IP) in his first 5 starts for the Sea Dogs... however, finished the season on a personal four-game losing streak spanning six starts, posting a 5.76 ERA... his strikeout high with Portland was 11 on July 22 at New Hampshire... Pitched for Magallanes in the Venezuelan Winter League, going 0-0 with 4.91 ERA in 10 games (two starts). After missing all of 2003 following "Tommy John" surgery, rebounded to earnPitcher of the Year honors with short-season Single-A Lowell...in 15 starts, led the NewYork-Penn League with 101 strikeouts and finished 2nd in the league with a 1.77ERA...with 101 K's in only 76.1 innings, averaged 11.9 strikeouts per 9 innings...heldopponents to a .160 average, allowing 2 hits or less in 7 of his 15 starts, including 6.0innings of one-hit ball in his final start August 31 vs. Hudson Valley, a game the Spinnerslost 9-1 after Sanchez left with a 1-0 lead...in 6 August starts, surrendered just 3 earnedruns over 34.2 innings to go 2-1 with a 0.78 ERA, lowering his ERA to 1.77 from 2.59 andearning Red Sox Minor League Pitcher of the Month honors...had consecutive 10-strikeoutefforts August 21 at Tri-City and August 26 vs. New Jersey, when 10 of the 14 outs herecorded came by way of the K...was 1-1 with a 0.50 ERA (2 ER/35.2 IP) at LeLacheurPark and 2-3 with a 2.88 ERA (13 ER/40.2 IP) on the road...following the season, pitchedfor Magallanes of the Venezuelan Winter League. Started 11 games with the Venezuelan Summer League Red Sox in 2002, posting a 5-3 record and 3.50 ERA...led the club with 73 strikeouts. Made his professional debut with the Venezuelan Summer League Red Sox after signing with Boston as a non-drafted free agent on January 3, 2001. 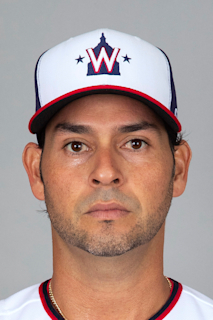 December 27, 2018 Washington Nationals signed free agent RHP Anibal Sanchez. October 29, 2018 RHP Anibal Sanchez elected free agency. May 29, 2018 Atlanta Braves activated RHP Anibal Sanchez from the 10-day disabled list. May 21, 2018 Atlanta Braves sent RHP Anibal Sanchez on a rehab assignment to Gwinnett Stripers. April 18, 2018 Atlanta Braves placed RHP Anibal Sanchez on the 10-day disabled list. Right hamstring strain. April 2, 2018 Atlanta Braves selected the contract of RHP Anibal Sanchez from Gwinnett Stripers. March 16, 2018 Atlanta Braves signed free agent RHP Anibal Sanchez to a minor league contract and invited him to spring training. March 16, 2018 RHP Anibal Sanchez assigned to Gwinnett Stripers. March 11, 2018 Minnesota Twins released RHP Anibal Sanchez. February 20, 2018 Minnesota Twins signed free agent RHP Anibal Sanchez. November 2, 2017 RHP Anibal Sanchez elected free agency. September 1, 2017 Detroit Tigers activated RHP Anibal Sanchez. August 31, 2017 Detroit Tigers sent RHP Anibal Sanchez on a rehab assignment to West Michigan Whitecaps. August 31, 2017 sent RHP Anibal Sanchez on a rehab assignment to West Michigan Whitecaps. August 18, 2017 Detroit Tigers placed RHP Anibal Sanchez on the 10-day disabled list. Left hamstring strain. June 19, 2017 Detroit Tigers recalled RHP Anibal Sanchez from Toledo Mud Hens. June 16, 2017 Toledo Mud Hens activated RHP Anibal Sanchez from the 7-day disabled list. June 5, 2017 Toledo Mud Hens placed RHP Anibal Sanchez on the 7-day disabled list retroactive to June 3, 2017. May 22, 2017 Detroit Tigers optioned RHP Anibal Sanchez to Toledo Mud Hens. October 5, 2015 Anibal Sanchez roster status changed by Detroit Tigers. September 23, 2014 Detroit Tigers activated RHP Anibal Sanchez from the 15-day disabled list. August 10, 2014 Detroit Tigers placed RHP Anibal Sanchez on the 15-day disabled list retroactive to August 9, 2014. May 18, 2014 Detroit Tigers activated RHP Anibal Sanchez from the 15-day disabled list. July 6, 2013 Detroit Tigers activated RHP Anibal Sanchez from the 15-day disabled list. July 1, 2013 Detroit Tigers sent RHP Anibal Sanchez on a rehab assignment to Lakeland Flying Tigers. June 17, 2013 Detroit Tigers placed RHP Anibal Sanchez on the 15-day disabled list retroactive to June 16, 2013. Right shoulder stiffness. December 17, 2012 Detroit Tigers signed free agent RHP Anibal Sanchez. November 3, 2012 RHP Anibal Sanchez elected free agency. July 24, 2012 Detroit Tigers activated RHP Anibal Sanchez. July 23, 2012 Miami Marlins Traded RHP Anibal Sanchez and 2B Omar Infante to Detroit Tigers; Detroit Tigers Traded RHP Jacob Turner to Miami Marlins; Toledo Mud Hens Traded C Rob Brantly to New Orleans Zephyrs and Erie SeaWolves Traded LHP Brian Flynn to Jacksonville Suns. October 11, 2010 RHP Anibal Sanchez assigned to Bravos de Margarita. August 21, 2009 Anibal Sanchez roster status changed by Florida Marlins. August 12, 2009 Jupiter Hammerheads sent RHP Anibal Sanchez on a rehab assignment to Jacksonville Suns. August 2, 2009 Anibal Sanchez assigned to Jupiter Hammerheads from GCL Marlins. July 28, 2009 Anibal Sanchez assigned to GCL Marlins. July 12, 2009 Florida Marlins transferred RHP Anibal Sanchez from the 15-day disabled list to the 60-day disabled list. June 5, 2009 Florida Marlins placed RHP Anibal Sanchez on the 15-day disabled list retroactive to June 3, 2009. Right shoulder sprain. June 2, 2009 Florida Marlins activated RHP Anibal Sanchez from the 15-day disabled list. May 28, 2009 Florida Marlins sent RHP Anibal Sanchez on a rehab assignment to Jupiter Hammerheads. May 8, 2009 Florida Marlins placed RHP Anibal Sanchez on the 15-day disabled list. Right shoulder strain.